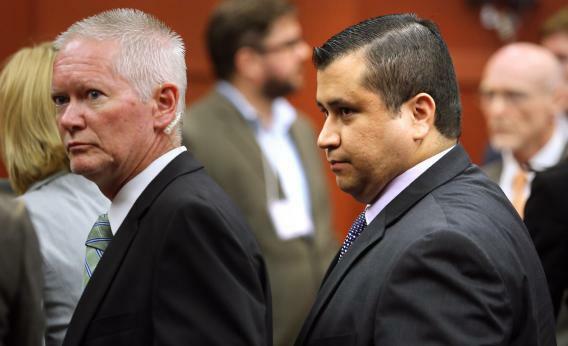 Zimmerman acquittal: Blame Florida for Trayvon Martin’s death. Zimmerman’s Not Guilty. But Florida Sure Is. Blame the state’s bad laws for Trayvon Martin’s death. George Zimmerman, right, is escorted from the courtroom a free man after being found not guilty July 13 in Sanford, Fla. It feels wrong, this verdict of not guilty for George Zimmerman. It feels wrong to say that Zimmerman is guilty of no crime. If he hadn’t approached 17-year-old Trayvon Martin, if he hadn’t pulled his gun, Martin would be alive. But that doesn’t mean Zimmerman was guilty of murder, not in the state of Florida. It doesn’t even mean he was guilty of manslaughter, though that was the middle ground I hoped the jury would find its way toward. (And in fact, the jurors asked for a clarification on the manslaughter charge during its 16½ hours of deliberation.) Here’s the problem: To convict Zimmerman of murder, the six women of the jury had to find that he killed Martin out of ill will, hatred, or spite, or with a depraved mind. The law didn’t account for Zimmerman’s fear or feeling of being physically threatened. But the physical evidence suggested that in the heat of the moment, Zimmerman could have felt both of those things. A forensics expert testified that from the angle of his wounds, it appeared that Martin was on top of Zimmerman when he was shot. The neighbor who came closest to being an eyewitness—there were none—said it looked to him like he saw a fight in which the person below, being straddling by the person on top, was wearing a red or a light-colored shirt. * That, too, suggested Martin was on top. Zimmerman did have injuries: lacerations to the back of his head from the pavement and a swollen bloody nose. It’s true that there was also evidence on the other side: None of Zimmerman’s DNA was found under Martin’s fingernails. None of Martin’s DNA was found on the gun. These facts contradict key aspects of the account Zimmerman gave police. Why believe him about the rest of his account? And even if you do give him the benefit of that doubt, why did Zimmerman feel so very threatened? Why did he pull his gun and shoot to kill? I don’t know. I don’t think we ever will. Zimmerman didn’t testify; he was never cross-examined. “Zimmerman the man may remain as much an enigma as the events of the night in question,” Jelani Cobb wrote in the New Yorker earlier this week. And all of this focus on the moment of the shooting telescopes this story in a way that feels misleading. It leaves out Zimmerman’s history of calling the cops on black people and his decision that night to follow Martin. It leaves out his excruciatingly terrible, patently racist judgment. But that doesn’t mean the jury’s verdict was racist. In Florida, a person “who is not engaged in an unlawful activity and who is attacked” has no duty to retreat. He or she has the right to “meet force with force, including deadly force if he or she reasonably believes it is necessary to do so to prevent death or great bodily harm to himself or herself.” The jury could have faulted Zimmerman for starting the altercation with Martin and still believed him not guilty of murder, or even of manslaughter, which in Florida is a killing that has no legal justification. If the jury believed that once the physical fight began, Zimmerman reasonably feared he would suffer a grave bodily injury, then he gets off for self-defense. Maybe that is the wrong rule. Maybe people like George Zimmerman should be held responsible for provoking the fight that they then fear they’ll lose. And maybe cuts to the back of the head and a bloody nose aren’t enough to show reasonable fear of grave bodily harm. After all, as Adam Weinstein points out, the lesson right now for Floridians is this: “in any altercation, however minor, the easiest way to avoid criminal liability is to kill the counterparty.” But you can see the box the jurors might have felt they were in. Even if they didn’t like George Zimmerman—even if they believed only part of what he told the police—they didn’t have a charge under Florida law that was a clear fit for what he did that night. This is what Slate’s Justin Peters meant when he reminded us earlier this week that the state has to prove its case beyond a reasonable doubt. “That hasn’t happened,” he wrote. “And if the prosecution can’t prove its case, then Zimmerman should walk.” This is our legal system. It doesn’t always deliver justice, and this case surely points to several ways in which Florida’s version of law and police work should change. It may demonstrate that Zimmerman should face federal civil rights charges. But what matters most is that Zimmerman was charged with Martin’s killing, even if he wasn’t convicted. The state was late to indict him, yes, and acted only after a sorry spell of botched police work that may have affected the evidence presented at trial. But Florida did try to hold George Zimmerman liable for Trayvon Martin’s death. Martin’s family and all his supporters get most of the credit. His father, Tracy Martin, wrote on Twitter tonight, “God blessed Me & Sybrina with Tray and even in his death I know my baby proud of the FIGHT we along with all of you put up for him GOD BLESS.” Yes, they did fight, and their battle meant something—meant a great deal—to so many parents of black boys in hoodies, and to the rest of the country, too. Tracy Martin is right to stress that fight for justice at this sorrowful, painful moment. No ill-conceived law, and no verdict, can take that away.